The caption to this political cartoon charges the Associated Press with trying to discredit and marginalize the People's Party by not reporting on it. The cartoon attributes the success of the People's Party to a circulating library of pamphlets on economic issues and a "reform press" that raised public awareness of the Populist movement. 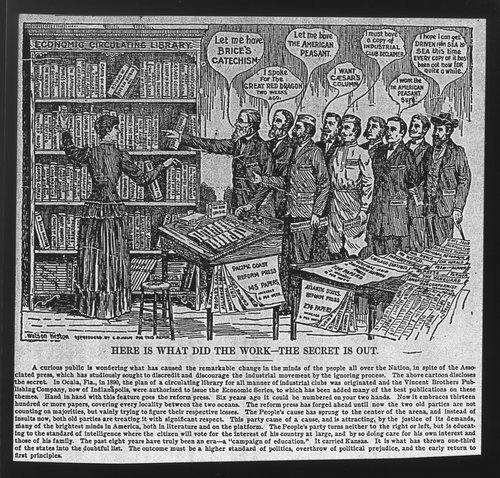 The illustrated cartoon shows a group of reform newspaper men requesting publications from the "Economic Circulating Library." Created by controversial cartoonist Watson Heston, the cartoon was reproduced in the People's Paper published in Stafford, Kansas. The People's Party took control of the Kansas legislature in 1890 when ninety-two Populists were voted into office. Two years later more candidates from the People's Party were elected. These Populist candidates included Governor Lorenzo Lewelling and all other statewide officials.